Kara captures both of their personalities infinitely better in her version of the battle. Lessa looked around her, guiding her gold dragonmount high over the unfamiliar landscape. It had similarities to Pern, after all - the dry, brown and gold rock, the hot, arid air of the Northern Continent. But there was an offness to it. She looked up at the sky. It was not her sky. The star Rukbat was gone, replaced by a single glowing orb. And where were the moons Belior and Timor? Her thighs tightened under her gold dragon as she looked about, wary and distrustful of this new place. Below her, she spied something moving along the cliff-face. She peered closer. It appeared to be a human, an old man in monk robes, if she had to guess. She urged Ramoth into a dive to ask to see where she was. "Hello!" she called out. The old man turned and smiled, waving a long stick at her in greeting. "Hello, what can I do for you, strange-maiden-on-a-weird-beast?" "Can you tell me where I am?" she said. "A long way from nowhere," he said. Lessa rolled her eyes and tried to be civil. "That isn't very helpful," she said, gritting her teeth. "And who ever said I was trying to be helpful?" The man's face split into a wide smile and he burst out laughing. He bent down to his knees, almost falling over. "If you're going to be nothing but a senile idiot, then I'll leave you alone." She turned her dragon to go. He held up a wrinkled hand, wiping tears from his eyes. "Wait! Seeing you lost is so much fun. We tengu thrive on fun, you know" he said, smiling again. But this smile seemed younger and even more mischievous, somehow. "What's a tengu?" she asked. She had never heard the word and the question slipped out of her mouth before she could stop it. Her curiosity got the better of her. The smile became very young then and slipped into a grin. "This," he said, mischief in his eyes. He stood taller, rising to the full height of a young man. The wrinkles smoothed and for a brief moment she saw him at her age. He was very handsome, perhaps even rivaling F’lar, though his nose might be a bit long. But then he continued to change. He grew… feathers. At first slowly, peeling up from his skin. But that accelerated until his whole body was covered in them. His face transformed to a bird's, resembling a large raven. His eyes were bird eyes, but they had the intelligence of a human. And they were still smiling. Lessa's mouth hung slack. He was a shifter. But she had only heard of those from the old legend of earth. She had no idea they could actually exist. "What are you?" she whispered. "Many things. Part demon, part friend, part trickster, and maybe the slightest bit human. I can hope so, at least. I am Goranu, and you may call me a prince if you like." He gave another bow. "Are you a good demon?" she asked, unsure how to proceed. People she could handle, even idiot girls like Kylara, but this? This was something different entirely. Goranu flapped his wings and took to the sky until he was level with them. His large raven's beak clacked and the sun made a bright line across it. "It depends. Are you a monk?" She opened her mouth to point out he'd been dressed as a monk, but realized they were getting side-tracked. "So then, are you going to help me?" He threw his head back and laughed again. "Just because you're a monk doesn't mean I'll help you. Like I said, you're much more amusing when you're lost." She hated being laughed at. Lessa clenched her hands until fingernail marks were left in her palms. She turned Ramoth to get away from this idiot demon. An sheer cliff wall blocked her path. Her mouth hung in open horror. What kind of power did this demon possess? He flew up to it and knocked. Chunks of rock broke away and clattered as thy fell. Then, he touched it and it became a door of paper. His black raven eyes glittered. "Just illusion. You are as easy to trick as the monks of Mount Hei. Even Mitsuko wouldn't have fallen for that." He bowed in the air. "Anything you'd like. Another gift we dreadful tengus have," he said. Lessa assessed the situation quickly. If she struck fast, he wouldn't have time to create another illusion to trap her. Besides, Ramoth was forty-five feet of raw power. This thing didn't have a chance. She snatched up her flame thrower and threw back the switch. Fire erupted in stream in front of her. "Kak kak kak!" he cried, flying higher. It sounded like an angry raven in distress. She could smell singed feathers. She urged Ramoth away before he could come back but had to raise the flame thrower as he came charging down, a curved sword in hand. The blow nearly knocked her out of the saddle. The prince pressed down with his sword, unrelenting. He was strong. "Illusions aren't the only thing we can do," he said, all traces of his former humor vanished. Her right leg was slipping. It was almost out of the saddle. She needed more time. Time. She had plenty of time! Had she not traveled back 400 turns once? She concentrated, made a glance at the single yellow star as reference and told Ramoth to go between in her mind. In a blink, they were gone. The mind-numbing painful cold nothingness of between sharpened her senses instantly. 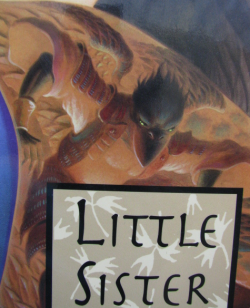 She held the image in her mind, just moments before the tengu had fallen from above, and urged Ramoth to go higher still and farther to the left on a collision course with the raven. There would be two of her for a few moments but all she needed was to knock him out of the sky, change the past of what would have been. She thought, and they were out. The jolt from blinding cold to this heat was shocking, but Ramoth had understood well. She saw Goranu and crashed into him. He fell, his wings flashing and twisting around him. He was almost 100 feet down before he caught himself. He glanced up to see the other Lessa blink out and turned to see her, still floating high above him. She blinked and there were twelve of him. They darted in and out of each other and she lost track of the real one. Then she had to fight them off as they came at her. They all smelt burned and singed like the real tengus. They were no cheap illusion. They felt real. Whoever he was, this prince was a master of his art. She could almost respect him except for the fact she knew that among them was the real one, and he had a very real blade. They buffeted her, pounded into her as if they were quite solid. She knew it was over. And then, it was. They all vanished, leaving her alone, floating in the air. She could not see the raven anywhere. Look there, Ramoth said in her mind. There, far below, was an old monk hobbling up the cliff face. He winked and held up his cane, but this time, she could see it was really a sword.